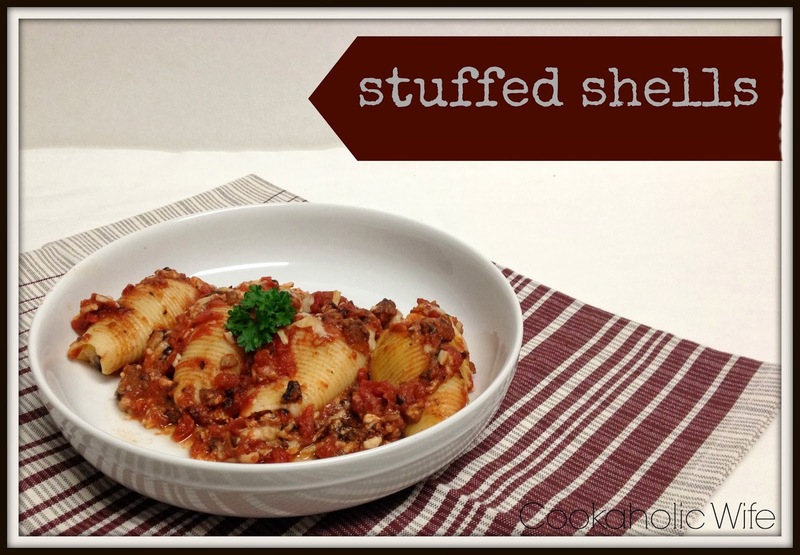 Recipe Remake: While this stuffed shells recipe is not super popular, I couldn’t pass up taking a new picture the last time I made it since the first one is so terrible! 1. Bring a large pot of salted water to a boil. Add jumbo noodles and cook for 9-11 minutes or until al dente. Drain and set aside. 2. Meanwhile, preheat the oven to 350. 3. In a large bowl combine the ingredients for the filling. In a medium bowl, combine the ingredients for the sauce. 4. Spoon a layer of the sauce mixture onto the bottom of a 9×13 baking dish. 5. Fill each shell with 1-2 tablespoons of the filling mixture and lay open side down in the baking dish. Repeat with remaining shells. 6. Cover the shells with the remaining sauce and then sprinkle 1 cup of shredded mozzarella cheese on top. 7. Bake for 35-40 minutes or until heated through and the cheese has melted. Divide shells among plates and garnish with fresh parsley. Now that the weather has finally changed to fall I go into a bit of overdrive with making “wintery” foods. The bad part about this is I usually die out of different things to make somewhere around January and start dreaming of fruits and lighter meals. I remember the first time that my dad made stuffed shells. We rarely ate anything more Italian that spaghetti so I remember thinking “what in the world is a stuffed shell?” He made them with ricotta cheese and ground beef. I took one bite, tasted the ricotta cheese and thought they were completely disgusting. Almost 20 years later, I still don’t like ricotta cheese all that much, but I learned that you can easily substitute cottage cheese for ricotta. I make lasagna with it too.